Earlier today ESA with much fanfare launched a new earth observation satellite. Something like this is always good news but the hyperbole used in marketing materials and press releases proclaiming how this will start a new era in earth observation etc. seem inappropriate to me. I certainly hope this is a success but i am somewhat more skeptical in my following analysis than many of those writing about the Sentinel satellites these days. ESA in particular emphasizes the open data aspects of the Copernicus program although in the past – to put it mildly – ESA does not have the best track record concerning openness. To understand this you have to know that ESA is a joint undertaking of many European countries and its governing bodies are largely influenced by political and economic interests. General worldwide scientific progress and improvements in our understanding of the Earth only plays a relatively minor role. Or to phrase it differently – ESA is foremost a bureaucratic moloch so it is not a bad idea to be skeptical about the idea that something innovative and revolutionary is coming out of it. It was interesting to observe their first somewhat inept steps in larger volume data distribution with the Sentinel 1 data. Compared to the methods used for example by the USGS this often seems unnecessarily complicated. You can see they are used to closed proprietary systems and have difficulties embracing established open standards. Their data query API for example seems to be fairly well structured but instead of using human readable data set identifiers based on data type, location, acquisition date etc. they use non-transparent UUIDs. Sentinel 2 covers a wider swath on the earth surface, 290km compared to 185km. Since orbit parameters are fairly similar (Sentinel 2 is slightly higher) it can cover a larger part of the earth surface in a given time span, in other words: you will be able to get more frequent and up-to-date data on average. Slight downside of the wider swath is that at the edges the viewing angle is larger than for Landsat making occlusion and image alignment problems with high relief more likely. 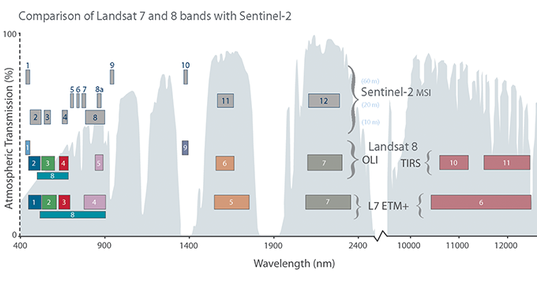 Sentinel 2 offers a higher nominal spatial resolution with 10m in four multispectral bands and 20m in six others while Landsat provides only 30m and 15m only in a single panchromatic band. This means more detailed data especially with small color details – provided of course the actual data indeed lives up to the claims of nominal resolution. Sentinel 2 does not have the thermal infrared capabilities of Landsat, its sensors are limited to the visible to shortwave IR range. The published acquisition plan of Sentinel 2 is similar to the mission profile of Landsat except that Sentinel 2 seems to specifically exclude the Antarctic. What is interesting is that comparisons of the Sentinel 2 capabilities with other earth observation systems shown by ESA seem to be based on early planning stages of the project and not take newer satellites into account. If this is just sloppy copy&paste work or a deliberate attempt to make the project look better i can’t say – the result is however that not really that competent journalists use this to support the ‘revolutionary new technology’ storyline, which in the end is mostly amusing but also somewhat questionable. Well – the new satellite seems to have some interesting capabilities and it is great if this will lead to more competition on the open satellite data sector but so far this seems more a gradual improvement rather than a game changer. ESA has announced the satellite’s data will be available under an open license – this license has an universal attribution requirement, you need to attribute them whenever you use the data in some form. It does not have a share-alike provision, more something of the opposite. Share-alike usually means derivative works have to be equally open. This is not the case here, you may impose any additional restrictions to downstream data users but are required to also impose the ESA terms – more something of a restrict-alike. The data products they plan to offer are also worth looking at. Those familiar with Landsat know that all Landsat data is distributed in form of WRS2 tiles. This is a rather ingenious concept – the WRS2 tiling is strongly tied to the low level structure of the data as it comes from the satellite. The data is kept in this system even at higher processing levels without making it cumbersome for the end user. There are some disadvantages in this like the overlap and redundancy between two neighboring WRS2 tiles along the same path but in general this has proven to be a useful and efficient system over the last decades. ESA plans to use a different approach for the Sentinel 2 data. For their low level data products (Level-1B) they want to tile the data in the satellite’s local view coordinate system into very small chunks by today’s standards. For the higher level products (Level-1C) they use an abstract fixed tiling system (based on the MGRS) that is unconnected to the satellite’s acquisition pattern. This means it is not straight away to determine which files contain for example today’s morning acquisition around a certain location. You will need to use their API (see above) for that. This system certainly has advantages, for example you can use it also for higher level data products combining multiple acquisitions. But it lacks the simplicity of the WRS2 system. And there are also some open questions like how they deal with the edges between the different projections in the UTM system. There is a toolbox they offer for further processing beyond Level-1C but although this is available as open source it is clearly based on the proprietary traditions at ESA. It is a monolithic Java system with a lot of ‘reinventing the wheel’ rather than using established open source frameworks. Integrating this into an existing satellite data processing workflow will likely not be feasible, reverse engineering specific techniques will of course be easier with the source code available (although the idea of browsing through Java source code for this purpose is not really a pleasant thought). In general this looks more like an alibi ‘we-try-to-look-open’ offering than a honest attempt to enable others to use their data routinely. Routine operation and i suppose also data availability are apparently expected to start in about three months. Then we will see how this turns out in practice. What i did not notice previously is that the red and green channel (3 and 4) are very narrow in case of Sentinel 2. This could be very nice for quantitative interpretations of the data but it could also lead to somewhat distorted colors in comparison to direct view.